We highly appreciate and sincerely value your interest in learning how to become an exclusive Bialetti Caffe Franchisee. We have built a solid foundation vis-à-vis organizational experience and people-support that leads to success. Ours is a system that has been proven, established, and passed the test of time. 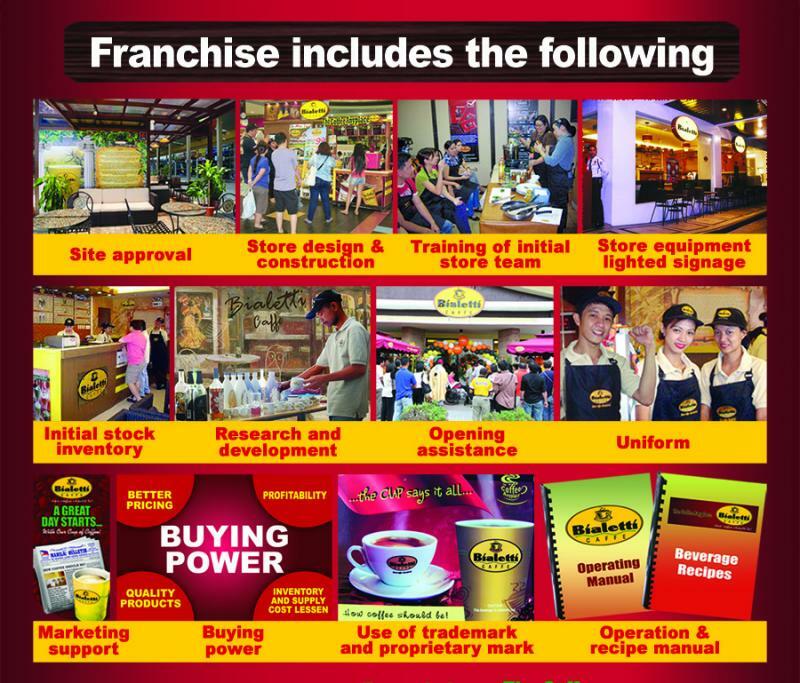 Franchising gives you the opportunity to go into business for yourself and thus accelerate your success by being part of a well-established branded system. The coffee business, just like fast- food 30 years ago, has shifted to chain-links because of their advantages viz specialized training, innovative product introductions, management control systems, purchasing power, plus specialized promotion and advertising. The passion for coffee has always been a key ingredient in successful coffee concepts. It is therefore not a surprise to see that the passion and love for coffee is what’s fuelling the growth and success of Bialetti Caffe. The company started out of pure love and longing for a perfect cup of coffee. Eventually, Bialetti Caffe hopes to reap great success as a result of an unparalleled combination of passion and professionalism. Likewise, the main focus will be to serve the best cup of coffee for the best price possible in a casual yet inviting ambiance. Bialetti Caffe provides an atmosphere of casual elegance, ambiance of a ‘home-away-from-home’ feeling and privacy where customers can enjoy their favorite cup of coffee while talking business, engaged in a vibrant discussion with friends,or simply to have some peace and quiet. Bialetti Caffe progressively introduces taste-tempting crepes, pasta, panini, delicious aromatic hot and cold thirst quenching beverages. Its great passion for quality has made Bialetti Caffe among the top as far as leadership in gourmet flavored coffees, varietals and blends are concerned. The quality and range of products it offers are at par or even better than well-known brands yet reasonably priced. The company buys its coffee right from the source and sees it as its mission to bring Italian-style espresso coffee, the outcome of an unmistakable blend and of unrivalled expertise in the making, to the discriminating clientele. We have tapped into the expertise of seasoned professionals in order to provide you with only the very best franchised coffee program at par with global standards today.